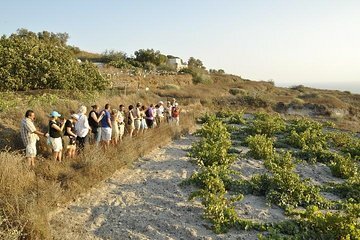 Levez votre verre à la culture du vin historique de Santorin au cours de cette excursion de dégustation et d'investigation sur le b.a.-ba du vin grec de 5 heures. Visitez trois des domaines vinicoles les plus populaires de l'île pour des séances de dégustation, qui contribuent à votre connaissance du vin local pendant que vous en apprenez plus sur la longue histoire de la viticulture de l'île, ses styles de vins préférés et des techniques historiques de vinification. Small tour and VERY well worth it! You get to see so much of the island, and the wine is, well, awesome. The guide was a Real expert in both the historie of Santorini and Winemaking and the 3 visits presented a variety of Wines and Technology - and the Pleasant company and talks with our fellow visitors made it a memorable trip. We ended up having a private tour! Our tour guide was amazing. We went to three very different wineries around Thera. Great experience and we had a lovely time. The tour guide was very friendly and informative. The tour was private and just for our group and the transportation was comfortable. The first wine venue was amazing and we felt like first class attendants. The second venue had great wine that won a lot of awards. The third venue was small and local - we were not impressed with this one and glad we bought our wines from the other two wineries. We got to stop and take amazing pictures on our way home which we appreciated.